Jurassic World is an online slot game based on the franchise of the movie Jurassic Park, made by world-renowned director Steven Spielberg, a few decades ago. Of course, the slot itself is based on the movie of the same name – Jurassic World, which was one of the greatest blockbusters at the time it came out, being hugely popular among cinemagoers and movie lovers. So, what can you except from Jurassic World online slot? Does it live up to the potential of the blockbuster movie? Read on to find out. The graphics and the music are inspired by the movie of the same name. But this game is far from a dumbed down version of the movie. The reason for this is simple – and it’s due to Microgaming’s graphic design department. If you didn’t know, Microgaming is the creator of Jurassic World, and is one of the biggest companies in the world of online casino games creation. Microgaming have made a name for themselves in the sense that they create wonderful animations that will leave you breathless while you’re watching them. Of course, you’re not playing slots for the graphics – you play them because they are fun and you can win some money while playing them. But the world-class level of animations is indeed beautiful to look at, and they will enhance your experience with this game. Also, the music of the game is beautiful – if you have the taste for this type of music, then you will love it. Jurassic World slot is a game that features incredible 243 ways to win. This is somewhat of a standard when it comes to the slot games created by the company of Microgaming. There are five reels that you will play on, and three rows. The symbols are taken from the movie as well – you will see various dinosaur symbols, as well as symbols of the main characters of the movie. All of them have different values, so you can see the pay table if you want to know more about what each symbol is worth. Finally, there are the special symbols – the wild symbol which can replace any other symbol except the scatter – and the scatter symbol, which can bring you the opportunity to play a bonus game within the game. 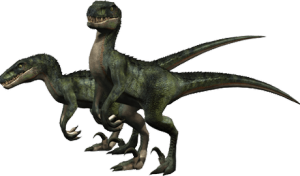 There are three options that you can select in the bonus game – the Raptor Den, the Creation Lab and the Gyrosphere Valley. Depending on what you’ll pick, you will get a handsome bonus in return, as a variable form of free spins. And perhaps the most epic feature of the game comes in the form of the appearance of the Indominus Rex, the scary dinosaur that can bring you a win multiplier of up to 1000x on top of your initial bet! 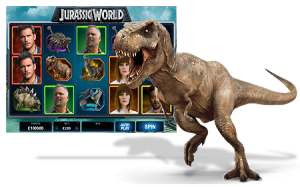 Is Jurassic World slot game worth it? The answer to this question is “absolutely yes”. You are bound to find a feature in this game that you will like. So, don’t waste any time and play Jurassic World slot right now.